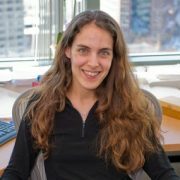 I joined Microsoft Research New England in 2008 after being an Assistant Professor of Computer Science at Georgia Tech and a postdoc at the Weizmann Institute in Israel and Microsoft Research in Redmond. I graduated from MIT, working in cryptography under the superb supervision of Shafi Goldwasser. I was also extremely fortunate to have the guidance of Adi Shamir for my master’s degree. My main research interests are Cryptography, the Theory of Computation, and Security & Privacy. Yael Tauman Kalai received her BA (1997) from the Hebrew University in Jerusalem, MA (2001) under the supervision of Adi Shamir at the Weizmann Institute, and PhD (2006) under the supervision of Shafi Goldwasser at MIT. After postdoctoral positions at Microsoft Research and the Weizmann Institute, she is now a Researcher at Microsoft Research New England. Her honors include an outstanding master’s thesis prize, a Sprowl’s award (cowinner) for best PhD Thesis at MIT. Her research focuses on cryptography.